Growing up, I remember my grandmother making the best Lemon Meringue Pie. There are family legends about her pie. She made it look effortless, pie shell from scratch and all! And it was so lemon-y it would make your cheeks pucker a little bit, but that’s how we like it. She would pull out a worn-out, handwritten recipe card each time but I don’t believe she needed it because I’m pretty sure she had the recipe memorized. She has a magic touch and a calm confidence in the kitchen, adding a little more of an ingredient if needed to make it taste just right. One of our family legends is that she would share a recipe with someone and purposely leave off an important ingredient. But of course being the sweet giving person she is, everyone who knows her knows this is a ridiculous joke. They made the joke because whatever recipe it is, if she makes it herself it always tastes better. Her Lemon Meringue Pie just tastes amazing because she has that magic touch and that’s something you can’t put on a recipe card. My grandmother is turning 90 years old this year and she still cooks for herself and goes overboard in the kitchen when she has visitors. We all adore her. As you can imagine, creating a low carb, gluten free version of my grandmother’s legendary Lemon Meringue Pie is a bit daunting and my own family will be the toughest to impress because they will be comparing it to The Original. 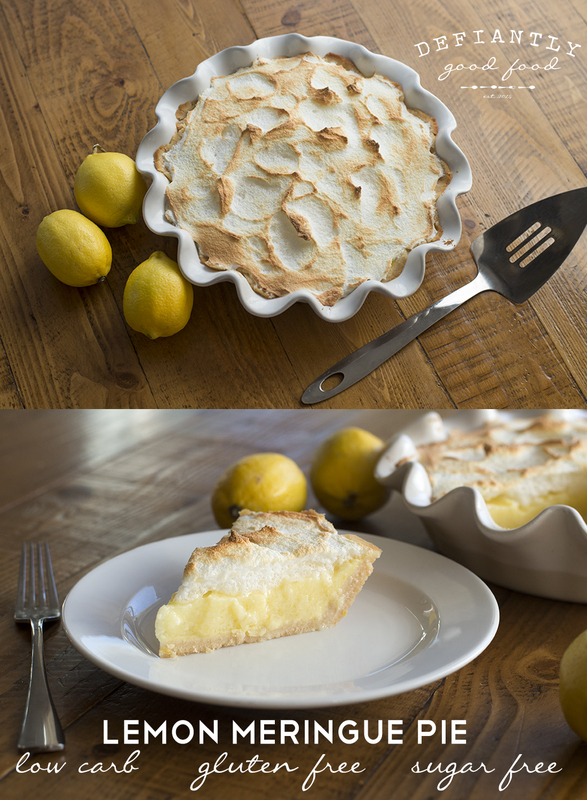 I wanted to make a pie that would not only satisfy a craving for lemon, but also connect me to my childhood and family history of eating my grandmother’s Lemon Meringue Pie. Luckily, my mom has mastered my grandmother’s Lemon Meringue Pie recipe. She shared it with me and then we worked together to create a low carb, gluten free, sugar free version that could do just that. I knew I wanted to use gelatin instead of cornstarch. Gelatin can be used as a healthier and zero carb alternative to cornstarch (see also: 10 Health Benefits of Gelatin), however if you use too much your lemon pie will be more like lemon jello, too little and it will ooze all over the plate when you cut into the pie…not pretty. There’s also the issue of the acid in the lemon counteracting the thickening process. It’s a delicate balance, which is why it has taken several attempts to perfect this recipe. Don’t get me wrong, we happily gobbled up each “failed” attempt, so they weren’t terrible…just not quite right. A few months ago, my cousin Patty was visiting and she helped us eat an overly tart version. She waited so impatiently as I beat the meringue for what seemed like forever with my hand mixer. (I now have a stand mixer and it makes the job much quicker and easier!) Our eyes squinted, our cheeks puckered, and every bite was followed by “ooh wee” as we ate that one down to the the last crumb. Unlike that one, this recipe strikes the perfect balance between sweetness and tartness and gets an A+ for consistency. My mom gave it her stamp of approval and that’s really saying something because she’s a Lemon Meringue Pie snob…it’s not her fault, my grandmother spoiled her. 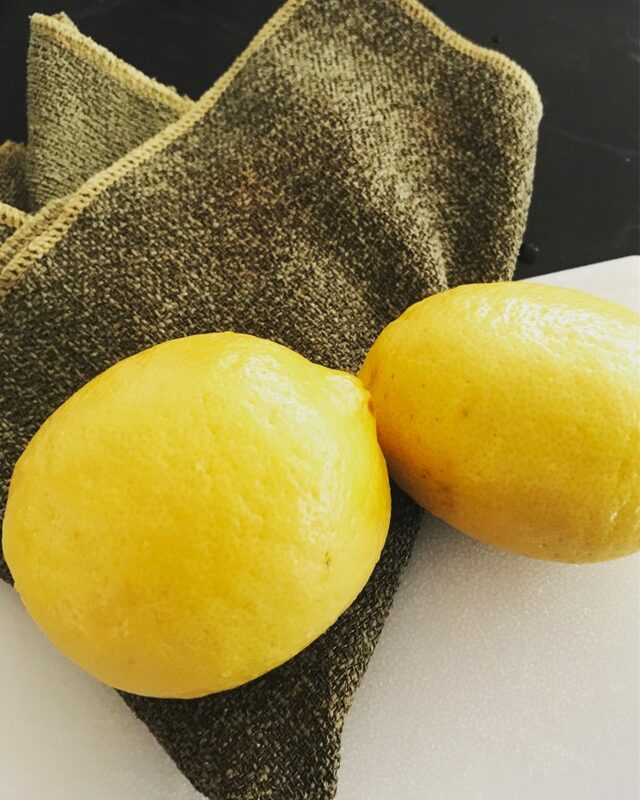 NOTES: Before zesting your lemons, make sure you wash the outside of them very well to get rid of any dirt, wax, germs and chemicals. This Fruit and Veggie Scrub Cloth does a great job and the scrubby side helps cut through any wax and get into the tiny divots, while the microfiber with silver imbedded really cleans and removes the dirt and germs. The silver is inseparable from the fibers and has natural antibacterial properties. Feingold: This can be a Feingold friendly recipe if you omit the crust and make it in small bowls, or substitute an approved flour like Namaste Gluten Free Flour for the almond flour. Dairy Free: This can easily be made dairy free by substituting a dairy free butter or coconut oil in place of the butter. 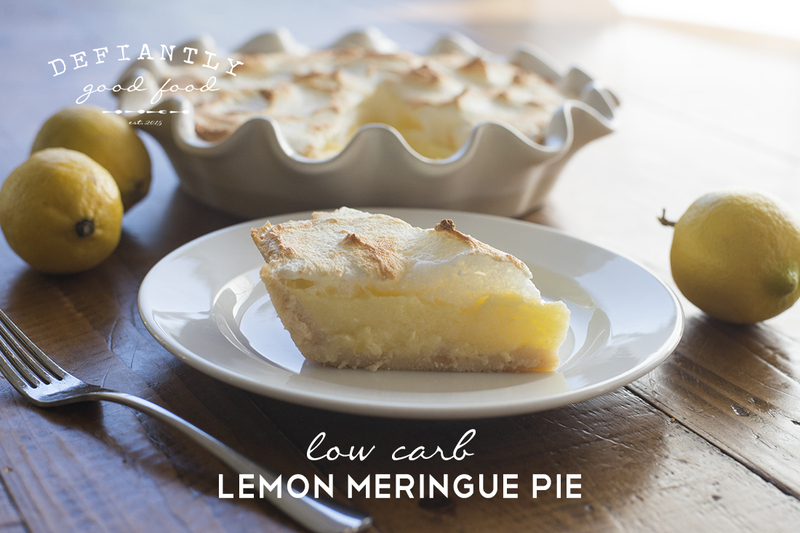 A low carb, sugar free twist on a classic lemon meringue pie sure to bring you back to your grandmother's kitchen table. Mix all ingredients with the back of a fork or pastry cutter. When well mixed, form into a ball using your hands. Press dough into a greased 9 inch pie dish. (optional) use pie weights or dried beans to prevent air pockets. Bake for 11-14 minutes. Allow to cool. Mix gelatin and water in a pot with a whisk over low-medium heat. Add Gentle Sweet, butter, zest and lemon juice. Temper the egg yolks by adding the hot lemon mixture to them 1 tablespoon at a time, whisking between tablespoons. I did about 5-6 tablespoons. Slowly add the tempered egg yolks to the pot of lemon mixture while whisking. Keep over low heat for 4-5 minutes, do not boil. Allow to cool in the refrigerator for a few hours before pouring it into the pie shell to fully cool. Preheat oven to 400 degrees F on broil. In large bowl, beat egg whites, Geltle Sweet, and cream of tartar with electric mixer until foamy. Beating until mixture forms stiff peaks. Top the pie filling with the meringue. Do this gently if the pie filling is not fully set to avoid mixing the layers together. Place pie on a center oven rack and set to broil on high or at 400 degrees F with the door cracked open to watch. 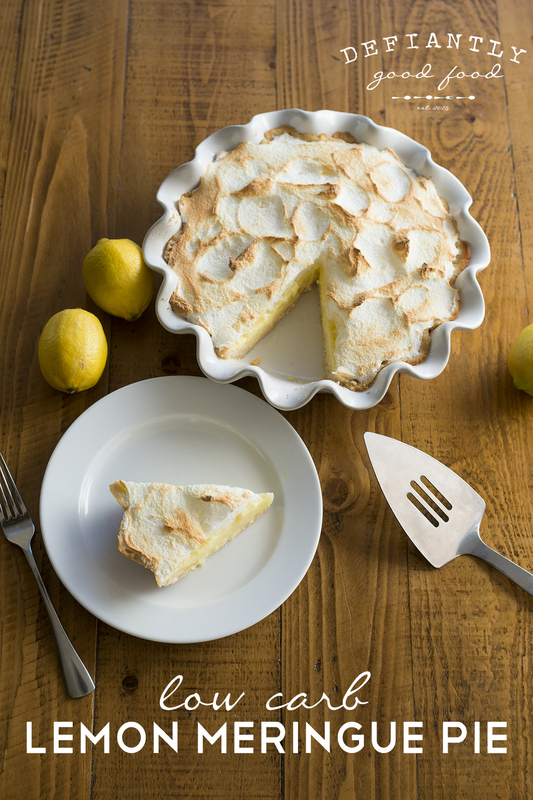 Remove pie when you see brown peaks and overall golden color on the meringue. This only takes a few minutes so don't walk away while the pie is in the oven. Allow pie to cool to room temperature before putting it into the refrigerator for a few hours to set. *Note about sweeteners: This recipe uses Gentle Sweet which is a blend of sweeteners. I highly recommend using this because it is such a close taste substitute for sugar and a healthy alternative to other artificial sweeteners, but I know how frustrating it can be when you want to make a recipe but don't know how to convert the sweetener amount. If you would like to sub the Gentle Sweet for Truvia or similar Stevia Blend, use the same amount as indicated in the recipe. If you are using sugar, Erythritol, or Xylitol, you'll use 1 cup for each 6 TBSP of Gentle Sweet indicated on the recipe. That looks really good. I love hearing stories about family. My grandmas were both very good cooks and bakers. Thanks for the recipe! Looks super yummy! Thank you. I love hearing stories from my grandmother from when she was a child during the depression living on a farm. So interesting! Enjoy the recipe! Thank you for this. Lemon meringue is my absolute favourite and being gluten free means I can actually eat this, no guilt! OMG! I know what I am making my mother in law this weekend. Looks amazing. Happy Mother's Day to you and your mother in law! Hope you enjoy this pie! So glad you love this recipe. I have been using almond and coconut flour in my recipes a lot lately. Love that this is a pretty clean dessert and low carb! This looks delicious and your meringue looks perfect! I have never been very successful with meringue, but I LOVE it! I'm going to follow your directions exactly to see if mine turns out as good as yours! Thank you! I hope you have success with your meringue. The cream of tartar really helps.